What are some of your fondest memories from being read to as a child? What if you found out recently they have experienced a re-imagining and grown in a way that would make them relevant as ever? Would it interest you? 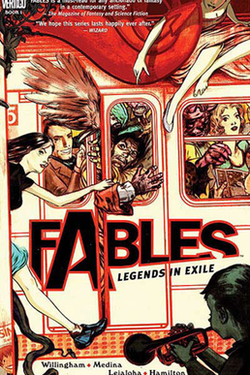 In the early 2000s DC Comics introduced a title that incorporated everyone’s favorite childhood nursery rhymes, folklore and mythological figures into a book called Fables. The abundance of these figures existing in the public domain give the writer, Bill Willingham, not only a bevy of properties to choose from but also the freedom to use them as he likes. His takes involve building off of the literary histories of those involved and giving them a modern twist. One interesting usage is the way he has taken all of the “Jack” properties, Sprat, Frost, Horner, etc…and folded them into one figure who has quite an exciting history. Here’s a list of every character to appear in the series. The premise is simple; having escaped from a place outside of reality known as the Homelands by an evil “adversary” many of your favorite make-believe friends are now on the run and living hidden away in New York City. Over the run of the comic, they have fought to maintain their cover, ultimately won back control of their homelands and now are in a bigger conflict with a villain named Mister Dark, which is a modern interpretation of the boogeyman. The book serves a bigger purpose than simply telling a story, amalgamating the traditional literary worlds and characters with an interpretation of modern life to give you a unique prism to view the world through. It just so happens you given a great story along with it. As I’ve grown I have become more socially and politically aware of the world around me. This series loosely deals in adult themes such as alienation, the definition of home (as Willingham is very much pro-Israel, and explores the idea early on with the Fables relocation from their Homelands to New York and a setting that may not be too welcoming to them) and ethical dilemmas. With 115 single issues collected in 16 graphic novels the series is building quite a novel history itself. Here is a link to a free download of the first issue. How many times have you heard that comic books are for kids? Honestly, the first comics I read were at about the age of 8, when books really weren’t something I cared about. Years later, an avid book reader, I still find solace in the medium and it’s “grown-up” form, graphic novels. Research that was first done a decade ago found the average reader to be in the ballpark of 29-years-old. This has led to a lot of interest in the properties and a large market for the publishers to cater to. By September of this year comics had made more than $250 million dollars and this isn’t counting the graphic novels or other licensed products. The graphic novel has become a respected form of media, even critically acclaimed outside of comic-centric circles behind such properties as Watchmen, Bone, Maus and Sandman. 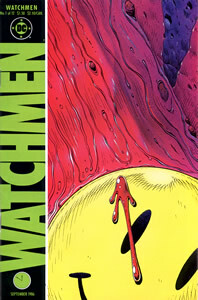 Watchmen is even more significant as it was the first graphic novel to cross over and be recognized as one of Time Magazine’s top 100 english language novels. At this point there are now ten recognized on that list. Popular culture has also been inundated with comic related properties, especially in the last couple of decades. Many of the highest grossing movies in American history were based off of comics and graphic novels, a number of those having been made since 2000. The biggest of the bunch was 2009s The Dark Knight. The movie starred such Hollywood heavyweights as Christian Bale, Heath Ledger and Morgan Freeman and grossed over $500 million at the box office. Still think of comics as child’s play? It doesn’t hurt that Disney and Time Warner own the two major comic and graphic novel publishers, Marvel and DC, respectively. A safe bet is to believe that this is only going to further the integration of graphic storytelling into other mediums. It has taken time but through acclaimed works and pop-culture assimilation this literary form has finally gained respect and is making an impact in lives of more than just “nerds” and “geeks”. Sometimes You Just Have to Rock!